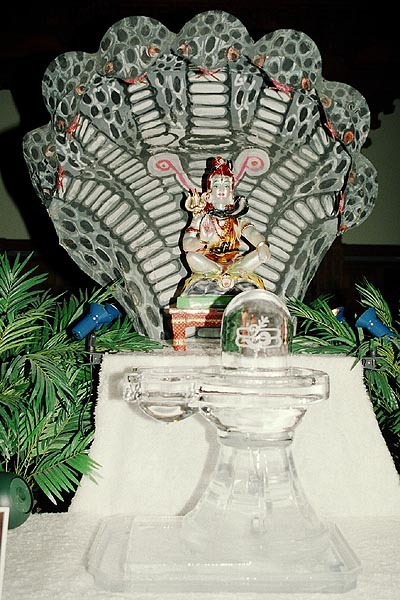 On Wednesday 18 February 2004, the auspicious festival of ‘Maha-shivratri’ was celebrated in a grand way at the Shri Swaminarayan Mandir in Neasden. Over 60 ‘falahar’ items were offered to the sacred images of Shiv and Parvati. A grand abhishek of the Shivling was performed with Vedic chanting by the sadhus. Thousands of devotees had the darshan of the ice Shivling and were given the opportunity to perform the abhishek with milk and bilipatras of the Shivling guided by priests.